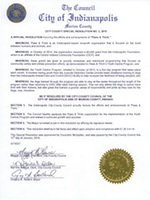 On Monday, January 12th, Michael J. McQuillen, Minority Leader on the Indianapolis City-County Council, presented a Special Resolution recognizing Paws & Think for their efforts in the local community. Having heard about the program from his wife, a librarian with Lawrence Township Schools, Councillor McQuillen visited the “Paws to Read” program at Crestview Elementary School where every Friday, students are invited to read books to the visiting dogs. The Special Resolution sponsored by Councillor McQuillen and signed by the Mayor honors Paws & Think’s efforts and achievements, and applauds them for the implementation of the Youth Canine Program. 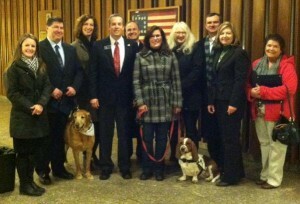 Paws & Think would like to thank Councillor McQuillen and the City-County Council for this honor, and looks forward to the continued success of the many programs it provides.